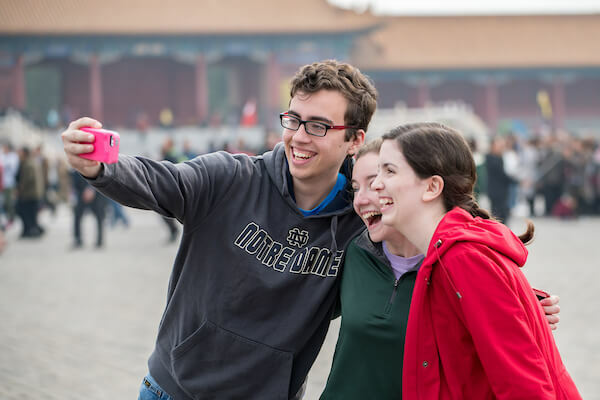 In keeping with the University’s mission to provide a holistic educational experience, students are afforded numerous opportunities to pursue an academic experience abroad during their time at Notre Dame. These include study abroad programs as well as independent research, internship, and service learning opportunities. The University strives to make education abroad accessible to students of all majors and socio-economic backgrounds. Study abroad programs operate year-round in spots all over the globe, from Australia to the United Kingdom. These programs feature rigorous academics paired with a new context that fosters cultural education as well. Students are encouraged to immerse themselves in activities and projects that provide learning outside the classroom and teach them ways to become responsible global citizens. Independent research opportunities abroad give students an opportunity to advance their studies through fieldwork or other means through guided consultation with a faculty member. A number of Notre Dame institutes and departments help fund these projects. Students often choose to pursue independent study as a way to jump-start their senior thesis, or as part of a graduate program. Internships are available abroad for students interested in gaining professional experience in an international setting. These internships are available through partnerships cultivated by the University via its global network and are facilitated by Notre Dame’s international institutes and Career Center. The Center for Social Concerns operates service learning opportunities all over the globe for Notre Dame students. These are both highly competitive and highly rewarding experiences with excellent preparation and reintegration programs. Students from every college and major can find an opportunity to expand their learning in an international setting.